Do you make full-synthetic (vegan) sandals? We are now offering vegan sandals on special order, using our UltraGrip models as the base. For these orders, the connections on the sandals and lacing that are usually made with leather will be replaced with our UltraGrip material. If you're interested in ordering, please send an email to Josh at josh@shammasandals.com RE: Vegan Order and include the model you'd like (Warriors, Chargers, or Mountain Goats). Prices are the same as our standard UltraGrip models. I can’t seem to decide on the sandal that I need, what’s right for me? Of course, the right fit for you has a lot to do with how you want to use your sandals. For casual wear around town, your house, etc, we like to go with Classics models and the Jerusalem Cruisers. For technical and trail running, as well as that feeling of wearing nothing at all, the Warriors are a good bet for you. If you like hiking, rocky paths, or are looking for something with maximum durability, then go for one of the Goats models, the Mountain Goats or the Old Goats. Whatever you decide, we think you’re going to be stoked! Are these be good for everyday wear, or just for running? Yes, they are great for everyday wear. They are built for performance, but that doesn’t just mean running. Walk, hike, or just relax – Shamma Sandals are comfy as well as durable, and you'll find yourself wearing them everywhere! Which footbed works best in wet conditions? Any of our UltraGrip models! UltraGrip is waterproof, and also dries quickly. For heavy water activities, we definitely recommend UltraGrip. Our leathers do ok in rain and with sweaty feet, etc. However, no leather really loves water. In very wet conditions where the leather becomes soaked, the leather will become slippery until it dries out again. For the most part it handles well unless it's soaked. In both cases, we also recommend getting Power Straps if you're planning on swimming, river crossings, and other conditions where you're fully submerged. How long do they take to break in? Your Shamma Sandals will start forming to your footprint immediately, but it usually takes around 1-2 weeks to get a good mold to your feet going from a fresh pair. It will continue to settle and become even more comfy in about 3-4 weeks. JCs form up the quickest, and will noticeably form within days. Warriors take a bit longer due to the density of their soling tread, even though they are thinner. The Classics models all form very quickly, in about a week. The Mountain Goat takes a bit longer to form because of its thickness, so more like 2 or so weeks. You should notice your comfort zone when the sandals begin to “hug” your feet, like your place in the couch when you get comfy, and then you’ll know that the sandals have formed up. Can you feel the toe plug? No – The toe plugs are specially molded and counter-sunk so that you don’t even feel them, but they’re super durable. Because they’re flush with the bottom of the sandal, they also last the life of the pair and beyond. There’s no knots or ties in the lace either so the toe strap is pure comfort. For water, we recommend any of our UltraGrip models, which are specifically designed for that and are waterproof. With leather models, generally a little water is not a problem, however once saturated they can become slippery until dried out. If you do plan on being in water often, we highly recommend an UltraGrip model. Please also note that leather footbeds may change color as they are natural products. Is the soling material thick enough? Yes, our soles give you protection without taking away “ground feel”, the sensations from your feet that keep you in touch with what you are running on and how your body is responding. The sole will mold to your footprint with use: your feet compress the soling material, and the entire sole will begin to take the shape of your foot. This makes them more comfortable sandals to wear and gives them a custom fit to your feet. The laces seem to make contact with the ground. Will they wear out quickly? Our laces are quite tough. The laces should last the life of the sandal and beyond. They may make contact with the ground, however they will not wear out in part because we do not put much pressure down with that part of our feet, and in part because the sole raises the lacing off the ground as it forms to your feet. If there is abrasion to the lace, it is generally cosmetic. What's the right sandal model for me? For casual, everyday wear, the Chargers are a great option. The serious minimalist will love the thinner, lighter, extreme flexibility of the Warrior. For the rugged runner or hiker, the Mountain Goats offer great durability. If you like an all leather look and feel, checkout the Classics collection. Shamma Power Straps are accessory straps designed for high-impact activities. These babies give you that extra layer of being locked in and stabilized in your favorite pair of Shammas. Where is my package? When will it ship? Once your order has been processed, we will make your sandals and ship them out to you. When the carrier gets the shipment, you'll receive an order notification telling you that your package has shipped. This notification also includes your tracking number. The tracking number can also be looked up at any time by looking at your orders on your Account page. Additionally, for those who chose to receive Messenger update notifications, you'll receive your updates and tracking number in Facebook Messenger. Do you have a sandal repair program? Yes! To get started, please send a request email to josh@shammasandals.com with Replacement in the Subject line. Please also include the sandal model and size in the body of the email. No problem! For returns, please visit our Returns Page and fill out the form there. What if I get the wrong size? Not to worry! Just choose "Wrong Size" from our Returns Page. Shamma sandals are unisex, and use our proprietary Shamma Sizing. Check our Sizing Chart page to find your perfect fit! Do you carry Children's sizes? Not currently, although we do make custom orders. If interested, please inquire by emailing contact@shammasandals.com. When the carrier gets the shipment for your order, you'll receive an order notification telling you that your package has shipped. This notification also includes your tracking number. The tracking number can also be looked up at any time by looking at your orders on your Account page. With any sandals purchase, domestic shipping within the USA is free! For international orders, please look at our international orders section. How do you ship your packages? Who is the carrier? We use USPS as our domestic carrier. For international orders, we ship with DHL Express. Do you ship internationally? How much does shipping cost? Yes, we do ship internationally! For up-to-date information, please check our Shipping Guide. To our awesome global community: Sorry but we have to charge shipping for international orders. We charge a flat rate in USD. We ship DHL for our international orders, the best service available. It typically takes 3-5 business days for international orders to arrive after shipping out, but can take longer in some cases. This is because we have no control over the Customs process in each country. Although we always complete and ship your order out quickly, we have seen some orders take longer to arrive due to Customs in some countries. Please also note that we have no control over Duties imposed by your country's Customs office. If you're worried about additional fees, please contact your local Custom's official. We recommend that you check with your Customs office for more information on processing times. We do all that we can to get your order into your hands as quickly as possible, but unfortunately we can’t control the speed of Customs processing. If you are concerned about ordering in time for an event or receiving your product as quickly as possible, again we need to say that we do not have any control over the Customs process of your country, even with the best shipping available. We are constantly looking for ways to improve your experience and reduce the cost for you, and this is the best available at the current time. We will continue to look for the best options for you so that you can get out their and enjoy your sandals! Do you have any European distributors? We do! Check our Store Locator page for up-to-date information. What is the Shamma VIP Club? The Shamma VIP Club allows you to earn points when you complete activities, and then redeem those points for rewards. Joining the VIP Club is free, and you'll earn points just for joining! Then, you can earn points for purchases, refering friends and more. How do I sign up for the Shamma VIP Club? It's easy! Just click on the VIP Club tab at the bottom of the page (on any page on the website) to get started. You'll need to create a free account to use the VIP Club. How do I refer a friend to get points? Log in to your account if you're not logged in already. You can do that by clicking on the user icon in the top menu. If you don't have an account, you can quickly create one for free. After you're logged in, click on the Shamma VIP tab down at the bottom of the page (any page on the site). It will take you to your VIP rewards. Click on the Refer Friends section and it will show you how to refer your friends. When anyone uses your custom referral link to shop on the site, the points will be attributed to your account for any purchases that they make! If you have a coupon code, you'll be able to enter it at checkout as you're going through the checkout process. Just make sure to add it before completing your order. I'm having a problem with my coupon code? If you are having any problems with your coupon, please contact us by email at contact@shammasandals.com and we'll help you out. Yes. We thank you for your service and are proud to offer a military discount. Please email us for more information. Do you offer a professional discount for Physical Therapists? While we do not have a special discount specifically for Physical Therapists, we do work with doctors, trainers, and coaches to provide products for demonstration and educational purposes. Please email us if you would like more information. I am a gear reviewer / blogger / brand representative. Will you send me your products? We work with bloggers, gear reviewers, and brands to get feedback on our products and also to spread the word about Shamma Sandals. We have a certain amount of product reserved for this purpose for established blogs and brands. If you would like more information, please contact Daniel - daniel@shammasandals.com. Occasionally, we will send coupons in emails to subscribers, or post coupon codes on social. We DO NOT use coupon aggregate sites to posts our coupons - if you see coupons there, they are fake. Running sandals? Huaraches? What are those? Athletic sandals and running sandals have only recently made a comeback in modern times. We all seem to have forgotten that humans relied on sandals for thousands of years! From marathon-running (and inventing) Greeks to warrior Romans to Inuit peoples to Japanese samurai - sandals used to be made as more than "flip-flops". In modern times, cheap manufacturing processes and off-shoring have led to a perception of sandals as only something for relaxing in. Luckily that's started to change. There are a lot of benefits to having your feet in the open air - your toes can splay, you sweat less, swell less (looking at you, Athlete's Foot), don't get nasty blisters, and you can flex and pronate your feet more naturally. This provides a whole bunch of benefits not only to your toes and feet, but also to your legs, knees, hips, back, and spine, which all rely on your feet for balance and coordination. Huaraches are a general kind of sandal in and around Mexico and are not always made as an athletic sandal. It's a term that became popular from the book, Born to Run. It's also not a super easy word to say. We prefer athletic sandals or simply running sandals. You can certainly do more than run in them - we have people climbing mountains, dead-lifting in the gym, kayaking, camping, fishing, backpacking, and even competing in Spartan Races. But we figure that if you know you can securely run in them, you can understand how dependable they will be for other activities. Shammas have been fine-tuned to create a secure hold on your foot while remaining so comfortable that you stop noticing they're there. We've spent a lot of time tweaking and adjusting until we've gotten sandals so minimal that they melt away and you don't have to worry about what you're wearing anymore. You just do what you want to do, and forget about the rest. Why make sandals? How did you start? Founder and owner Josh Stiles was having back and knee pain after years of playing sports. He specifically recalled having a particularly bad softball game that threw him over the edge - and began trying all of the available footwear he could get his hands on. 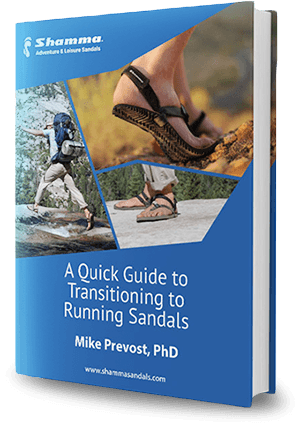 After searching and not finding anything that worked for him, he began to create his own sandals, and discovered that many of his chronic sports pains began to go away. Many versions later, Josh began making sandals for friends and family - sandals that you could be active in, run in. It turned out that other people were interested. As more and more changes were made to make new sandals, Josh realized that he had to get serious. Now, years later, we continue to take feedback from foot doctors, trainers, coaches, barefooters and more to constantly improve our products. The spirit of the sandals remains the same: sandals that are secure, comfortable, and allow natural movement of the foot - sandals that you can live in. I've tried other brands / sandals / huaraches. What makes Shammas different? Fortunately there are a number of options out in the world for people these days! It wasn't always like that. Because huaraches in general are pretty minimal, there's some similarities in how they look. But it's just skin-deep - once you try a pair on, you'll notice the difference immediately. With any good athletic sandal, what you want is something that allows range of movement but also securely locks your foot and the sandal together, comfortably. To be active, agile and balanced, you need to avoid slipping between your footwear and your feet - no flip-flopping! A lot of factors go into this - material composition, footbed, the lacing system, weight, thickness, connection points, even stitching. We refuse to sacrifice on quality even with our thread, which is military-spec. It comes down to the details. Shammas have been fine-tuned to create a secure hold on your foot while remaining so comfortable that you stop noticing they're there. We've spent a lot of time eliminating hot-spots and manufacturing custom machines and parts to solve small problems. Once we solved enough of these small problems, it led up to a big total - sandals so minimal that they melt away and you don't have to worry about what you're wearing anymore. You just do what you want to do, and forget about the rest.